Lovely pieces of natural/rough Blue Apatite. Nice pieces with good colour. Blue Apatite is thought to be beneficial for treating problems of the mouth, teeth, throat, thyroid, cartilage and high blood pressure. It is said to strengthen muscles and bones and is also believed to be good for the healing of broken bones, as well as in the treatment of arthritis, rickets and joint problems. It is said to reduce stuttering and to promote healthy eating habits. It is also thought to soothe headaches and to be helpful to hyperactive children. Blue Apatite helps us with public speaking and with communicating ideas to groups of people. This makes it an ideal stone for those who practice humanitarian ideals, e.g. teaching, communicating, healing and the passing on of knowledge. It enhances our creativity, clearing mental confusion and frustration and teaching us self-expression. 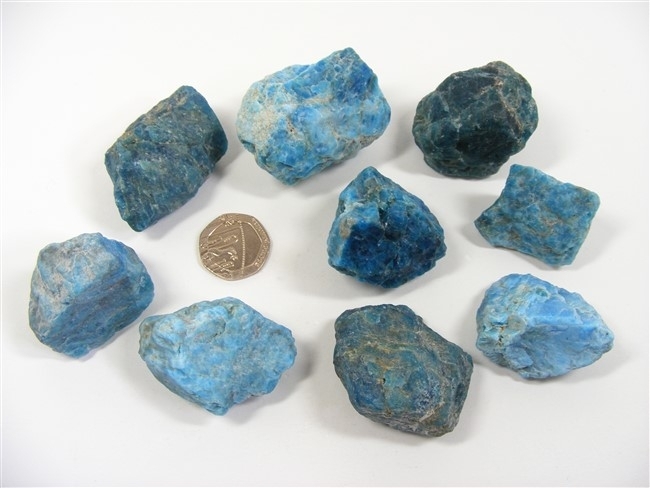 Blue Apatite can increase our willpower, our motivation and reduce our irritability and aggression. It helps us in overcoming sorrow and apathy and encourages openness and a sense of being at ease in social groups. Blue Apatite helps us to reach deeper states of meditation and of reflection. It helps us to develop a better sense of spiritual attunement, promotes spiritual insight and also helps to connect us to a very high level of spiritual guidance. Blue Apatite provides us with insights into our past lives and is thought to also enhance connections with UFO's. It promotes telepathy, clairvoyance, clairaudience and clairsentience. It also helps us to have more meaningful dreams and can help us with astral travel.